This is a photography, narration and art project presented as an installation art and performance. Realized in Paris between 2016 and 2017, and is still in progress. The Firstnames List is a chapter of an ongoing greater project about “The Contemporary Oblivion”: this one is dedicated to women. The project is composed of a photo-text series, a drawings set, several items that intervene the space, ephemeral drawings and writings on the walls of the exhibition space, a dining table with the reproduction of a family dinner, sound and audiovisual equipment. The photography series is strongly influenced by the Provoke photography and talks about a social phenomenon apparently widely showed by the media but that doesn’t stop increasing: violence suffered by women, and femicides, not exactly in a documentary way, more in a poetical narration of mourning. 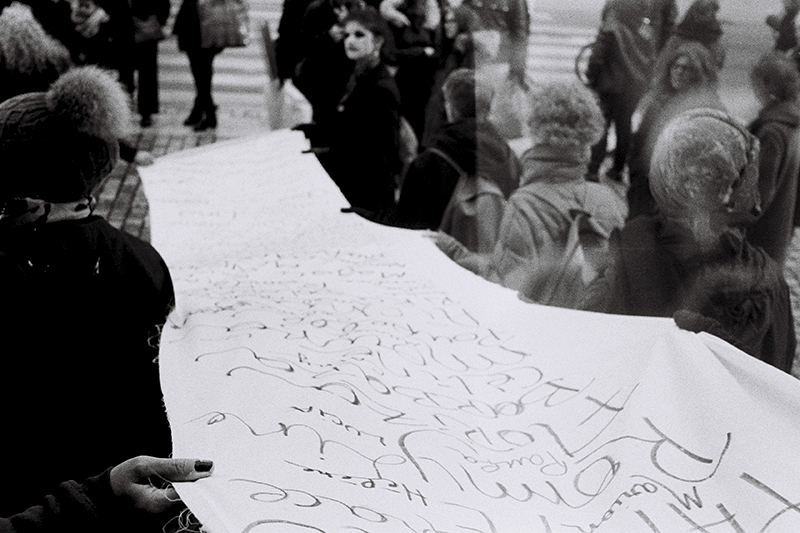 The pictures and texts are inspired by the amateur dance group of the Paris’ surroundings : ARTivisme. 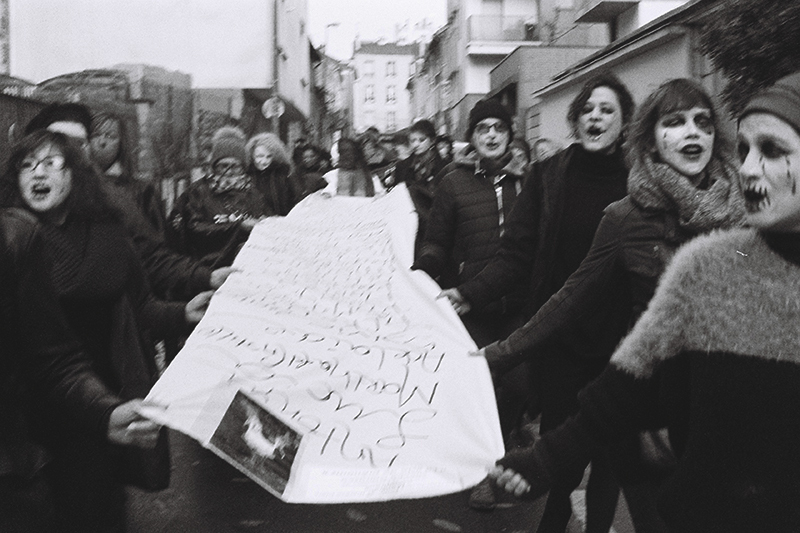 The ARTivists organize interventions and performances in the street by taking back the public space to denounce the violence suffered by women, street harassment, and other themes related to the feminist fight, in one of the French departments with the highest rates of femicides, street harassment or domestic violence: Seine-Saint-Denis. Most of them were victims themselves. They work actively with associations that help women to fight for their condition. I went to meet this troop, and i was fascinated by the great capacity of resiliation that the victims of gender violence experiment in the performance. While taking pictures of their process, I found myself with a forgotten intimate story, printed on the web of my child’s memory. To continue my life, I must have forgotten a whole past of family violence, and this was a starting point of my Oblivion works. In order to continue a “normal life”, how many traumatic moments do we need to put aside? But how the reminiscences of these moments affect our lives without realizing it? The shots talk about a mourning, a scream against oblivion, an infinite list of firstnames of those who cannot scream anymore – the texts are part of an intimistic diary that has never been written and which words begin to dig into a dialog with the pictures. The installation pretends to submerge the spectator into these women’s demonstration, but also wants to remember the name of all of those women that are becoming mere statistics numbers, making their humanity completely invisible. 31th may / 01st jne. MSH Paris Nord. Table ronde Visibilité et invisibilité : une tension à l’oeuvre. Avec Eric Marty et Marie-Laure S. Luis. Nov 2017. 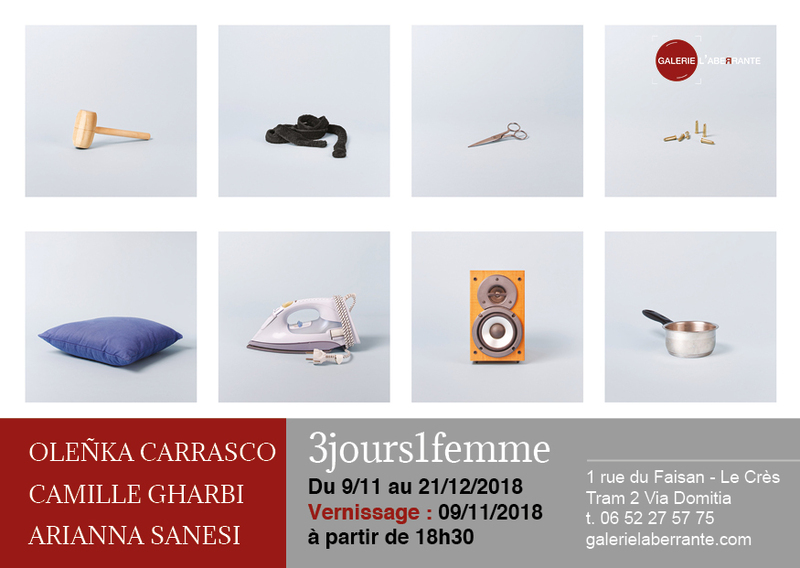 Performance, action collective, La Liste de Prénoms est portée lors de la Manifestation contre la violence faite aux femmes par les ARTivistes. Oct-Nov 2017. Carte Blanche Maison des Femmes de Montreuil.